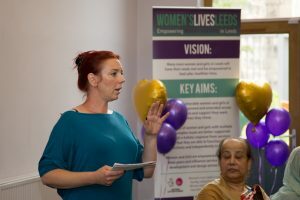 As part of the Centenary Cities government funding, Women’s Lives Leeds have been working in conjunction with the Leeds City Council to deliver a series of workshops across Leeds, culminating in several celebration events. We have events planned in the West, South, East and Central Leeds, to celebrate the achievements of women over the past 100 years, and in particular, the right that they were given to vote. 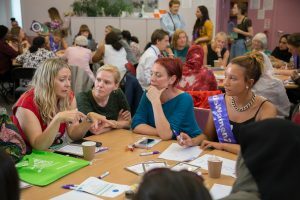 Leading up to our celebration event in the South, which took place on the 18th July, we organised several workshops to identify and address the issues local women are facing. Through engagement with them in local community settings, we were able to discuss practical ways of bringing about change; primarily through voicing concerns to those within local politics that can support that process. The workshops and activities were led and facilitated by Sabina Hussain, Community Development Worker for the Women’s Lives Leeds Project, covering the South East of Leeds, and hosted by the Asha Neighbourhood Project. The work was carried out in conjunction with the ‘Khushy Dil’ Group, Hamara Women’s Group, Learning Curve and Temple Newsam. 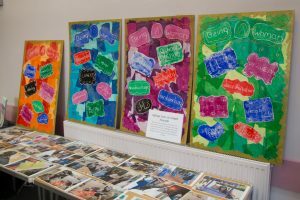 The artwork and letters that were produced during the workshops truly reflected the diverse community of women residing in South Leeds, with many of these women being particularly disadvantaged, and either not being able to speak English, or English not being their first language. 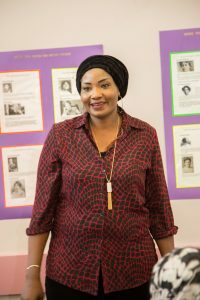 We were able to engage with women in the first instance by keeping the interaction purely conversational; and by communicating with them in their mother tongue, we were able to really capture what it means to them to be a woman, without any language barriers. Women were encouraged to share their valuable life experiences, including much of the discrimination that many of them face on an ongoing basis; either as a result of the religion that they associate with, their race, gender but also cultural restrictions that can often play a part in their daily living on a more personal level. As a follow-up activity, women were invited to participate in a workshop at Temple Newsam that involved an exciting suffrage tour around the house, in which women were given an insight into the history of the house, and what the involvement was of the powerful women that have lived there with the suffragette movement. The feelings that women identified within the preceding workshops, and during the tour were then captured in some artwork which was later exhibited at the celebration event. 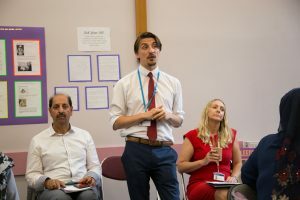 There were also additional workshops organised and delivered in partnership with Learning Curve that were hosted by The Asha Neighbourhood Project. The theme was to address local issues affecting women and to identify ways of getting involved in local politics to bring about change in those areas. These workshops gave women a valuable opportunity to enhance their learning through discussion, role play exercises and support with writing letters to their MP; identifying their concerns and suggestions on the improvements that they wanted to see implemented. These letters were also displayed at the celebration event on the 18th July. The celebration itself was a massive success! It was held at The Building Blocks Centre in Beeston, with many local women attending the event. Elected councillors from the South also attended to support the event and discussions whilst further reinforcing the importance of women’s involvement in local politics to help inform change. 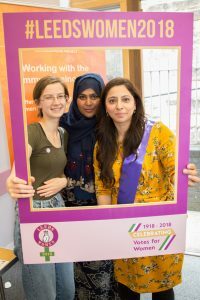 Councillor Jules Heselwood, Leader for Women in Leeds City Council, was also present, and delivered part of the introduction, in which she highlighted the various initiatives taking place throughout the year across Leeds, to celebrate the centenary of women acquiring the right to vote. 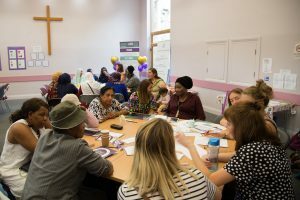 The celebration event gave women the unique opportunity to meet their local councillors and partake in four table discussions on different topics identified as priorities by the women in the workshops leading up to the event. The topics that were discussed were ‘Safety’, ‘Violence Against Women & Girls’, ‘Employment & Education’ and ‘Environmental Health’. Many of the women felt comfortable enough to contribute to the table discussions, and language support was available to women where required. There was an open question and answer panel where women were able to direct questions to the local elected council members on the issues raised during the table discussions, and the event was opened and closed quite fittingly with 2 inspirational women sharing their personal stories, involving recovery from addiction, and the challenges of being an asylum seeker/refugee; with an inspiring focus on hope and victory. The room was silent as everyone listened to the two women re-living their past and present experiences in such a courageous manner, despite the adversity that they had experienced. It was a truly moving experience for all of those who were present. The event was concluded with applause for all the women involved in the centenary activities and flowers were presented to the two brave women that shared their inspiring stories. The next event to take place as part of the centenary celebrations will be in the East of Leeds on 19th of September at The Shine in Harehills, led by Libby Tinworth. Keep an eye on our social media pages to find out more!